Each chieftain believes to have the most legitimate claim to the throne of this new island. Only time will tell who among them will ascend to become Ard-Ri, the High King of this new realm! Each game round consists of two phases. First is the Assembly Phase, during which players check for victory, determine who the chieftains are, and draft Action cards. Next is the Season Phase, during which players play cards from their hand. 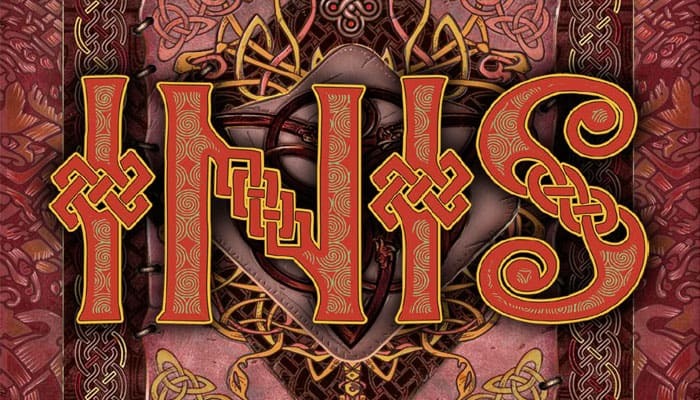 Important: In Inis, the only way a player can perform any action in the game (placing new clans, moving clans, building Sanctuaries, etc). is by playing a card. Because of this, which cards you draft during the Assembly phase is essential to you winning the game. Be present in six or more territories. Be chieftain over a combined total of six or more opposing clans. Be present in territories with a combined total of six sanctuaries. A new territory is always placed adjacent to at least two territories. When a new territory is placed, its matching Advantage card is taken from the Advantage deck and placed faceup by the play area. Each figure is a clan. Each player has 12 figures of one color. There are multiple sculpts, but the different sculpts do not affect gameplay. If a player has all 12 of his figures on the board, he cannot recruit more clans until some of them have been returned to his reserve. There are two building types: Citadels and Sanctuaries. There is no limit to the number of buildings a territory can contain. If a player attempts to place a new building in a territory, but there are no more buildings of this type in the reserve, he cannot place this type of building. Buildings do not belong to any player in particular. Sanctuaries are necessary to achieve one of the victory conditions. The Brenn is a temporary leader until someone is appointed High King. He is randomly determined at the start of the game, and during each Assembly phase the title of Brenn is passed to the Capital territory's chieftain. The Brenn organizes the Assembly and, at the end of the game, has an advantage in case of a tie with another player. 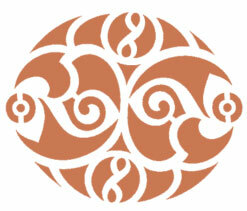 This token shows which direction to resolve turn order: clockwise or counterclockwise. It is tossed by the Brenn during each Assembly. When a player meets a victory condition's requirement, he takes one Pretender token to show that he is a pretender to the throne. Only players with a Pretender token can attempt to claim victory during the Assembly. This marker is used when the "Festival" Action card is played during the Season phase. Each card has a specific type (Action, Advantage and Epic Tale), timing icon (Season or Triskel), and effect. Players keep cards in their hand secret from their opponents, but the number of cards in their hand and which card types (visible on the card backs) is not secret. Players discard cards after playing them. Season cards are played during the Season phase on the owner's turn. Triskel cards indicate a specific timing when they can be played. During the Season phase, an Action card allows a player to perform important actions such as recruiting new clans or placing new Sanctuaries. How to Acquire: These cards are drafted during the Assembly phase at the start of each round. Allowed to Keep: These cards are not kept from round to round. If a player does not play all of his Action cards during the Season phase, they are discarded and shuffled with the other Action cards to prepare for the next round. How to Acquire: During the Assembly phase, the chieftain of each territory takes its matching Advantage card. Allowed to Keep: Once an Advantage card is in a player's hand, that player keeps it for the entire round until he chooses to play it. Even if an effect causes him to no longer be chieftain of the matching territory, he still keeps the card in hand (and can play it) until the end of the round. These cards are not kept from round to round, but the same player can have the same Advantage card in back-to-back rounds as long as he is chieftain of that territory. 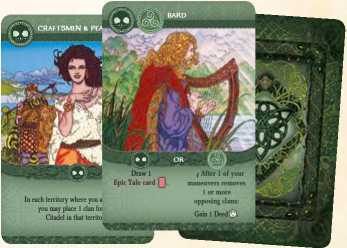 These cards evoke the Celtic gods and heroes, and they inspire the clans to accomplish legendary feats. How to Acquire: These cards are drawn when certain game effects occur, such as the "Bard" Action card or when placing a new Sanctuary. Allowed to Keep: These cards are kept from round to round until played. Here is a list of all Epic Tale cards. In a 2- or 3-player game, return the Action 1 cards that have a 4 in the bottom- right corner to the box; they are used only in a 4-player game. Each player chooses a color and places his 12 clan figures 2 in front of him; this is his reserve. Place the Deed tokens 3 , the Pretender tokens 4 and the Festival Marker 5 near the play area. Shuffle the Epic Tale cards 6 and place them in a facedown pile. Shuffle the territory tiles 7 and place them in a facedown stack near the play area. Draw a number of territory tiles 8 equal to the number of players and place them faceup and interlocked to each other at the center of the play area. Each tile must be adjacent to two other tiles. Search for the Advantage cards 9 that match the territories in play and place them faceup near the play area so that each card is visible. Place the other Advantage cards 10 in a facedown pile. Give the Brenn marker 11 to a random player. The Brenn chooses one territory to be the Capital and places the plastic Capital 12 and one Sanctuary 13 there. The Brenn flips the Flock of Crows token 14 like a coin. The faceup side indicates the direction of turn order at the start of the game. 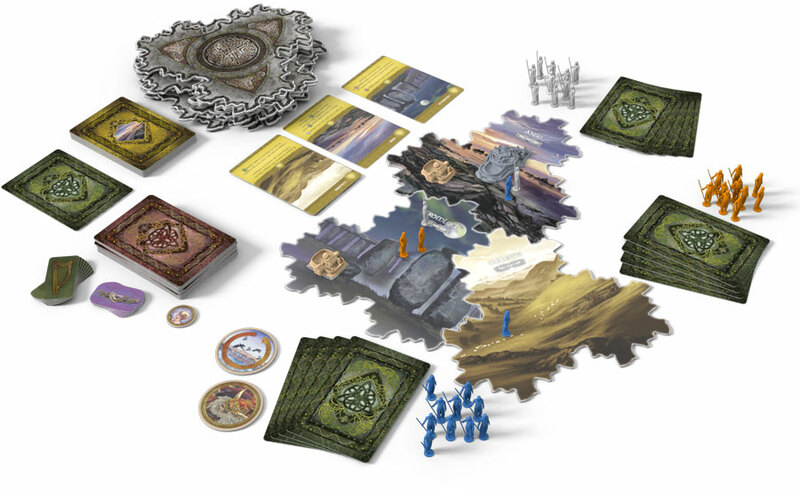 Starting with the Brenn and proceeding in the direction indicated by the Flock of Crows token, each player in turn places one clan in any territory until each player has two clans somewhere on the board. 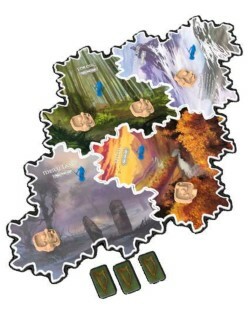 4 players: Valley, Cove, Plains and Hills. 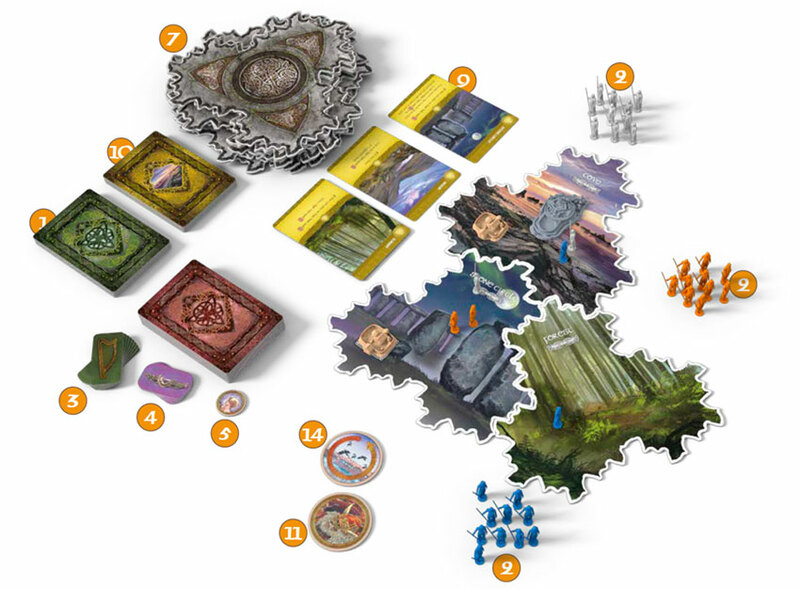 Before creating the stack of territory tiles, search for these tiles: Meadows, Misty Lands, Forest, Gates of Tîr Na Nóg, Highlands and Mountains. Shuffle these tiles and place them facedown to create the bottom of the stack. Shuffle the remaining tiles and place them on top of the stack. 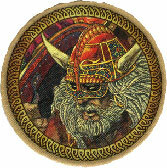 The chieftain is an important concept used by several game effects. The player who has the most clans in a territory is chieftain of that territory. In case of a tie, that territory has no chieftain. Assembly Phase: The Brenn is appointed, victory conditions are checked, turn order is set, chieftains take Advantage cards, and players draft Action cards. Season Phase: This is the core of the game, during which players perform various actions and effects by playing cards from their hand. The chieftain of the Capital territory becomes the Brenn and takes the Brenn marker. If the Capital territory does not have a chieftain, the Brenn does not change- even if none of the current Brenn's clans are present in the Capital territory. The Brenn can change only at this time, not during the Season phase. Check to see if a player has won. Victory conditions are explained further on page 10. Players return all Pretender tokens to the supply, if they had some. The chieftain of each territory takes that territory's matching Advantage card. If a territory does not have a chieftain, the Advantage card stays faceup near the play area. Important: Any game effect that refers to "next player" or "in turn order" uses the order shown on the faceup side of the Flock of Crows token. For a 4-player game The Brenn takes all 17 Action cards, shuffles them, randomly sets aside one card facedown, and deals four cards to each player. For a 3-player game, same thing but there is only 13 cards because the ones that have a 4 in the bottom-right corner were returned to the box during the setup. Each player looks at his four Action cards, chooses one to hold, and passes the other three to the next player, as indicated by the Flock of Crows token. Next, each player adds the one card he held to the three cards passed to him. He looks at all four Action cards, chooses two to hold, and passes the other two to the next player. Finally, each player adds the two cards he held to the two cards passed to him. He looks at all four Action cards, chooses three to hold, and passes the other one to the next player. At the end of the Assembly phase, each player has four Action cards in hand and maybe some Advantage and Epic Tale cards. The Brenn begins the Season by playing the first card, which must be a Season card. This continues with each player in turn order doing one of the three options until all players have consecutively passed, which ends the Season phase. Then a new round begins with the Assembly phase. Action cards are discarded in a facedown discard pile. Players can look at the cards in this discard pile only when a card effect allows it, such as the "Druid" Action card. Each played Advantage card is placed facedown near the play area with its card back visible. Epic Tale cards are discarded in a faceup discard pile, and players can look at the cards in this discard pile at any time. The player does not play any cards and simply passes. He will be able to play cards again if the turn comes back to him. The player must meet at least one victory condition and cannot already have a Pretender token. He takes a Pretender token from the supply and places it in front of him. This token is kept until the Assembly phase, even if at a later point the player no longer meets any victory conditions. If a player has no clans in any territories when his turn begins, he must discard a Deed token if he has one. Then, whether he discarded a deed token or not, he places a total of two clans in any territories. After that he can take his turn as normal: play a Season card, pass, or take a Pretender token. When all players have consecutively passed, the Season ends. Players keep all Epic Tale cards in their hands, but they must discard all Action cards. If a player has an Advantage card in his hand and he is no longer the chieftain of that territory, he places that Advantage card faceup near the play area. A clash occurs when one or more clans are moved to a territory where any opposing clans are already present. Also, some card effects can cause clashes to occur without any clans moving. A clan that is "placed" in a territory (such as the "New Clans" Action card) does not initiate a clash. When a clash is initiated, the owner of the incoming clan is the "instigator". 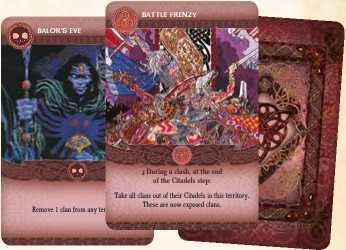 When it is a card that initiate a clash, the player who is the instigator is indicated on the card. Then the clans present in the territory need to decide among them how best to settle their differences-either aggressively or peacefully. As soon as a clash occurs, players immediately resolve the clash before continuing on with the round. If a single effect results in multiple clashes (such as the "Migration" Action card), the instigator chooses which clash to resolve first. After resolving the first clash, he chooses which clash to resolve next, and so on until all clashes have been resolved. Check here for more information about resolving clashes. There are three victory conditions. Each player can meet several victory conditions. During Step 2 of the Assembly phase, Check for Victory, players check to see how many victory conditions each player with a Pretender marker currently meets. Chieftain over Six or More Opposing Clans: Add up the total number of opposing clans in territories where the player is chieftain. If there are six or more, the player has met a victory condition. Present in Territories with Six or More Total Sanctuaries: Add up the total number of Sanctuaries in territories where the player has one or more clans present (even if he is not the chieftain). If there are six or more, the player has met a victory conditions. Present in Six or More Territories: Add up the total number of territories where the player has one or more clans present (even if he is not the chieftain). If there are six or more, the player has met a victory condition. The degree to which a player meets a victory condition is not important, but the total number of victory conditions met is important. 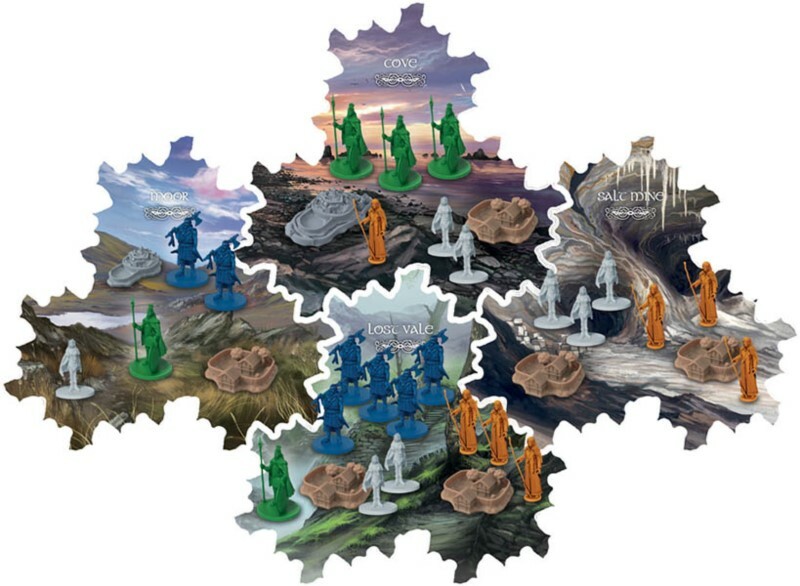 For example, if two players meet the "territories" victory condition (one player being present in six territories while the other is present in eight), both are tied and equally considered to have met the victory condition. Players acquire Deed tokens by using cards like "Bard" or "Master Craftsman". Players keep their Deed tokens in front of them and visible at all times. Each Deed token can act as a "wild" toward meeting any one victory condition by adding "1" to the number of specified requirements. Each Deed can be used only once to complete a single victory condition. During Step 2 of each Assembly phase, Check for Victory (and only at this time) players check to see if there is a winner. If no player has a Pretender token, then there is no winner-even if players currently meet one or more victory conditions. Otherwise, check the victory conditions of each player who has a Pretender token: The player who meets the most victory conditions wins! (He must meet at least one victory condition in order to win). if the Brenn is among the tied players, he wins the game. if the Brenn is not among the tied players, there is no winner. If there is no winner, all Pretender tokens are returned to the supply, and the game continues for another round, proceeding with the rest of the Assembly phase. 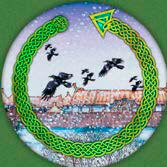 In 2-player games, the Flock of Crows token is not used except for resolving the Gates of Tír Na Nóg's territory effect. Do not forget to remove the Action cards with a 4 , in the bottom-right corner, as they are not used in a 2-player game. Shuffle all Action cards and randomly set aside one card facedown. The Brenn deals three cards facedown to each player. Each player looks at his three Action cards, chooses one to hold, and passes the other two to his opponent. Each player looks at his three Action cards, chooses two to hold, and passes the other one to his opponent. Each player places his set of cards facedown in front of him. Once again, the Brenn deals three cards facedown to each player. Just as before, the players draft this new set of Action cards as explained above. At the end of the draft, each player has a total of six Action cards that were chosen in two drafts. Chieftain: The player who has the most clans in a territory. In case of a tie for most clans in a territory, there is no chieftain. The chieftain receives that territory's Advantage card during the Assembly phase. Assembly: At the start of each Season, the chieftains gather for an assembly where they divvy up the responsibilities that need to be fulfilled during the upcoming Season. Brenn: The Brenn is a tribe leader who is chosen to guide all the tribes into the island. He is the highest authority until the High King is elected. The Brenn organizes the Assembly, acts first during the Season, and has a great advantage in case of a tie for victory. He is determined at random at the start of the game and can change over the course of the game. Capital: The territory chosen by the Brenn at the start of the game. At the start of each Assembly, the Capital's chieftain becomes the Brenn. Citadel: A fortified village. Citadels allows players to send their clans there to seek refuge and protection during clashes. Sanctuary: A place of worship. 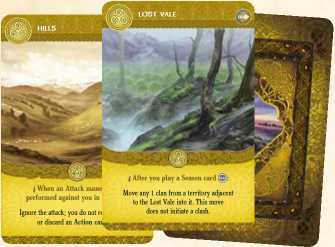 Being present in territories with Sanctuaries is one of the three victory conditions, and placing new Sanctuaries in a territory allows a player to draw an Epic Tale card. Present in a Territory: A player is present in a territory if he has one or more clans there. Attack: One of the maneuvers that a player can choose during a clash. Instigator: The player who initiated a clash, typically after moving some of his clans into a territory.